There’s no doubt that James McNamee is a man of many missions. To us, he’s the mover and shaker behind our farm’s fledgeling hop business. At work, he’s a team leader who inspires loyalty and commitment. In fact, one of James’ biggest strengths lies in team building. James may have physically left Garston many years ago, but it’s a place still dear to his heart. So it was with some delight — and perhaps trepidation — that in September he let his separate worlds collide. That turned out to be a win for all. The occasion was the Fulton Hogan Communications Team annual conference; the purpose was Team Building, inclusiveness and open communication and the result was wildly successful — beyond any of our expectations. Fulton Hogan employees and representatives from partner companies Telstra, Spark, Mobile Mentor and DataCom flew into Queenstown from all parts of Australia and New Zealand. But before the conferencing and presentations they came further south for a “Garston and Beyond” experience that many will never forget. It’s nearly lambing time on the farm and we had the conveyor in to give the ewes their pre-lamb treatments. In days gone by this was a slow and back-breaking job which took ages and stressed sheep and workers alike. But with the advent of conveyor contractors, the ewes get their vaccinations, long-lasting drench and mineral supplements in one morning’s work. The whole thing proved to be fascinating to our visitors. Conveyor crew from the “birds-eye view.” Conveying is fast and painless for the sheep. They couldn’t help with injecting the vaccinations etc of course but they loved the birds-eye viewing platform we’d arranged. Some thoroughly enjoyed mucking in and getting their hands (and boots) dirty in the yards, helping to move the sheep up to the conveyor. Gavin proved particularly handy in the pen. I don’t know if he had worked with sheep before but he seemed to be a bit of a natural. It wasn’t long before he learned just how strong pregnant sheep can be. It’s not easy when a sheep barges back at you, but he soon found the knack to turning them around. Gavin earning his morning tea by moving the sheep towards the conveyor. Soon it was time for a typical farm “smoko’ — morning tea— and then we moved onto the second task for the day. Hops grow tall — basically as tall as they can get and most of the flowers grow at the upper levels. So when the shoots start to appear in late spring we wind the best ones up 4-metre high strings. These are cut down with the plant at harvest time so fresh strings need to go up each spring. This was the task James now set his team, and they were delighted to help. It’s a job that takes longer than you’d think and definitely proved a team building winner. Once they got a system worked out, things flowed smoothly and they got more than half the required strings up. It was so helpful to us — saving us a lot of work at a busy time of year — and I think the team enjoyed knowing that they were doing real farm work instead of a manufactured experience. The hops strings are up. It was such a help for us to have this done and dusted before lambing time. We wanted to give our visitors a taste of the high country, so who better to call on than Tom O’Brien at Welcome Rock Trails. There’s nothing like standing on top of a mountain drinking in the views and we were so lucky with the weather. I’ve been up that mountain in many different conditions: howling gales, rain, snow, mist not to mention scorching sun. But on this day there was none of that: the weather gods gave us calm and warm, with a touch of cloud. Perfect! A beautiful afternoon to start a trek along the Welcome Rock trail. If I had to sum up the walk in just one phrase it would be snowball fights. While most of the trail was clear and dry, there was just enough snow in the sheltered spots to make it interesting — especially for those who had not seen snow before. Of course, James threw the first snowball. After that the air filled with flying snow missiles every time we encountered a new patch. Unfortunately for the team James managed to evade all their snowballs on the way up, while still landing a few telling blows of his own. James McNamee, snowball at the ready. The team got their revenge on the way home. No longer needing James to lead the way, they forged ahead and ambushed him while he was distracted by a phone call. Even without snow, the 27 km trail is a perfect introduction to the New Zealand high country. Don’t worry: we didn’t make our guests walk quite that far. The 45 minute hike to the actual Welcome Rock gave a taste of adventure and plenty of steps to add to the 10,000-steps-a-day “Steptember Challenge” which many of them were doing. And just down the track from the rock was the welcome sight of Slate Hut and the smell of food. Laura, from Real Country and Hamish (local friend, farmer and neighbour) were busy barbequing a much-needed feast. It seemed a long time since the morning’s smoko. Retracing our steps past Welcome Rock and down the Nevis Road, the team headed to the Real Country base at Kingston where Laura had organised clay bird shooting and archery. Clay birds, for the uninitiated, are discs about the size of a CD, which are shot into the air out of a spring-loaded trap. It takes a good bit of coordination to hit a moving target, which makes clay shooting quite a challenge. I must say, the team proved pretty handy at both activities. There’s nothing like the thrill of aiming at and hitting your target, so it proved to be a fun challenge to end a tiring day. Southland is full of amazing scenery and diversity, but we couldn’t show it all in a day, so we loaded up the four-wheel drives and Laura’s van and headed west towards the back blocks that hold a special place in McNamee hearts. As the crow flies, the Mavora Lakes and Mount Nicholas Station are really just over the hill. Unfortunately we’re not crows, so we had to take the long way round by road. The clouds were down and drizzle fell often, which made us especially thankful for Sunday’s fine weather. I haven’t been into the Mavoras (as they’re known locally) for years, but they were just as beautiful as I remembered. There’s magic in misty lakes and mountains and the lakes were serene and still. They were a lovely place for the “Steptember crowd” to get a few more steps in — but woe betide those who came back late to lunch. One of the two Mavora Lakes on that misty, moisty morning. 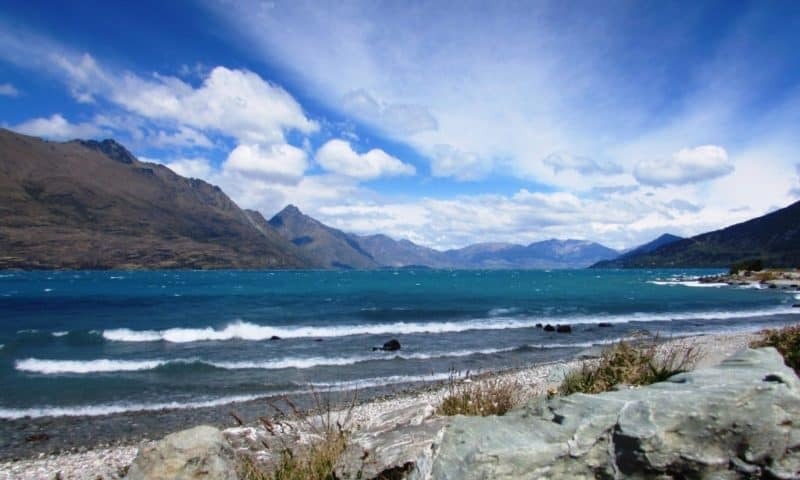 As we trundled towards Lake Wakatipu, James memories came flooding out. That long fence-line disappearing into the distance — 3 of his brothers built it back in the ‘70s. There’s the Von Hut nestling under the mountain: we’ve heard many a tale about Fall Musterers and the nights they spent there with the dogs and horses bedded down outside. Now we remember the story of one brother becoming disoriented in a snowstorm on one particularly difficult muster. He’d have died if his dogs hadn’t cuddled warmly around him. And the one about a teenage James — allowed to tag along one day. He jumped over a creek, didn’t quite make it and ended up with a wet boot. Too scared to mention the problem in case he was sent back, he learned an important lesson instead. Turns out it’s pretty hard to keep up with an experienced mountain musterer when you’re slipping and sliding inside wet boots. Some of the team at Home Creek on Mt Nicholas Station. All too soon, it seemed, our journey had finished. We’d stopped at Home Creek, talked with Bruce, the Mt Nicholas tourism operator, at the enormous woolshed and trundled the road between stations down to the Walter Peak wharf where the team was due to catch the Earnslaw steamship back to Queenstown. This was goodbye time for the Garston crew. We were driving the trucks back along the track. It says a lot for the inclusiveness of the conference team that we were sorry to see them go. Tom, Hamish, Laura and I loved meeting and spending time with this diverse bunch of people. While we were trundling back the way we came, there was one last treat in store for the team. They had been in at the beginning of our hop story — now they were heading to the home of the beer brewed from last year’s hop crop. Altitude Brewing took all of our green hops last year and made a special brew — Jimmy Mac’s — with them. I”ve heard from those in the know that it’s a pretty good beer. No doubt the team got to taste it — and some of the others on offer at Altitude’s newly-opened premises down by the lake near Frankton. Making connections and building understanding and trust is a theme that runs through a number of my posts. After all, people are more likely to be friends… to do business… to connect… with people they know, like and trust. It’s a lesson that many businesses today are beginning to learn; that collaboration and cooperation, social enterprise and ethical practices work better in the long run. They’re better for our health, our environment, our politics and our world. It seems to me, after meeting the IT Service team from Fulton Hogan, that this is a group actively building the know, like and trust factor. It has been a real highlight of my year & I am at a bit of a loss to properly express just what a great time I had! Meeting the other vendors face to face was very valuable, as was spending time with your team outside of our normal daily work-situation. The time away has reinforced to me just how special those relationships are. So really, in the end, it’s all about people, how you treat them and the relationships you forge. I’ve taken a few lessons from James’ book over the years I’ve known him, but this is surely one of the best.